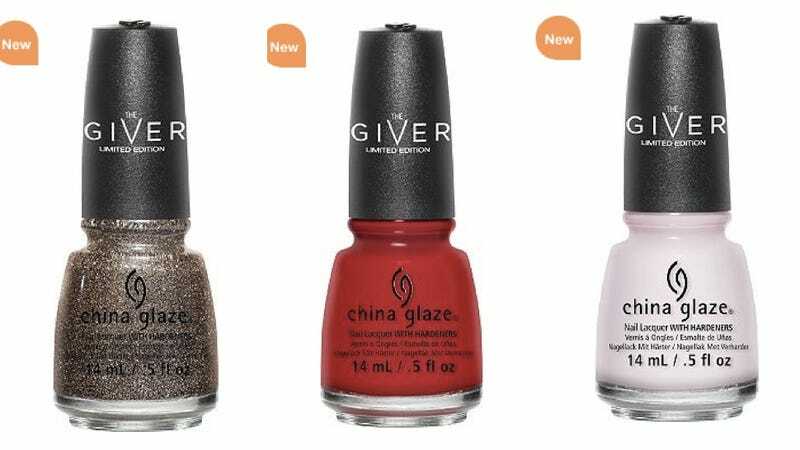 Tell me, when you first read The Giver back in fifth grade, did you think to yourself: "I'd really love some red nail polish inspired by this powerful work of young adult fiction!" If so, today is your lucky day. Refinery 29 points out that China Glaze has introduced a collection of limited edition polishes, pegged to the movie. (In the book, the main character lives in a bland, emotionless society and is initially unable to see colors.) (Not sure whether manicures are allowed?) (Spoiler alert for those who never got around to The Giver.) Available shades include "Seeing Red," "Capacity to See Beyond," "Boundary of Memory," and "Five Rules." They are available for $7.50 a pop at Ulta. It would be easy to take this as a sign that the movie adaptation of The Giver is a tasteless atrocity. But for what it's worth, Lois Lowry seems pretty happy with the movie and in particular really likes Meryl Streep! She told Variety she wishes she could rewrite the character of the Chief Elder after seeing her performance: "It was beefed up by the writers and then blown sky high by Meryl Streep's performance. She's become a complex character, which she was not in the book." I'm not sure what happened between "The Giver" and maybe 15 years later when these others suddenly burst forth. Nobody copied "The Giver." Those ideas are out there and emerge. But I'm glad it happened. Although there's too many of them now. But I think that trend is ending. We'll go on to the next trend and we all wish we knew what that was so we could go out and write it. Dystopian fiction is passé now. From your lips to God's ears, Lois.